Using as much of your property to grow food is becoming more and more popular.Unfortunately there are some that don’t feel that food growing should be in public view. I don’t know when fruits and vegetables were looked at as unattractive but proper planning can make for an attractive vegetable garden. Sometimes, however, no matter how attractive you make it your neighbors may not be happy and neither will your city, especially if you live in an HOA. Fortunately you can be sneaky and go with perennial plants that most people won’t realize are food producers or they do know they are but because they are also consider ornamentals they get a pass. Here are just a few that you can plant in your front yard that can fool everyone. Arbutus or Strawberry tree is a California Native evergreen tree with beautiful decorative red bark, clusters of small pink flowers which become dry edible fruits. They aren’t the best tasting on their own but you can make preserves from them. Aronia, or chokeberry is a large shrub native to North America and is now considered a super fruit (whatever that means). Small white flowers are followed by clusters of black or red fruit. Has showy fall color. Deciduous. Artichokes have a wonderful architectural structure and texture that compliments many other plants. Their gray-green fronds die back in the summer but they are the first things up and at ’em when the rains start. If you don’t get to the buds in time just let them bloom. They are the most gorgeous blue-purple color. Blueberries are on deciduous to semi-evergreen shrubs. You’ll need at least two different varieties for pollination. They have fantastic fall color. In the spring they are covered with delicate white flowers which are followed by the fruit. They do need acid soil so if your soil isn’t quite right grow them in containers. 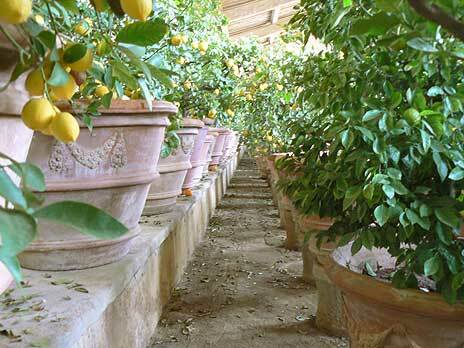 Citrus trees, particularly dwarf citrus, are great accents for any front yard and do well in pots. If you live in a colder climate you can keep them in pots and then move them indoors when the weather gets too cold. Stevens Cranberries make a nice sprawling evergreen groundcover that turns purple in the winter. The do not need to be in a bog, as most people think. The bog is only created temporarily because it aids in harvest (the berries float). Currants are very attractive deciduous shrubs with hanging clusters of pink flowers followed by clusters of showy fruit that comes in a variety of colors including red, black and white. 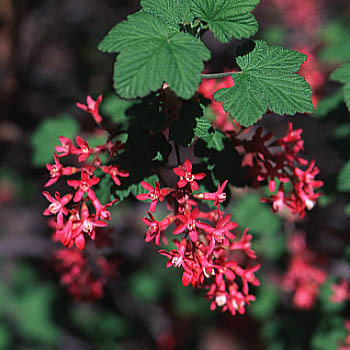 There are California native currants (Ribes) that are also edible but more drought tolerant. They are related to gooseberries but don’t have thorns. 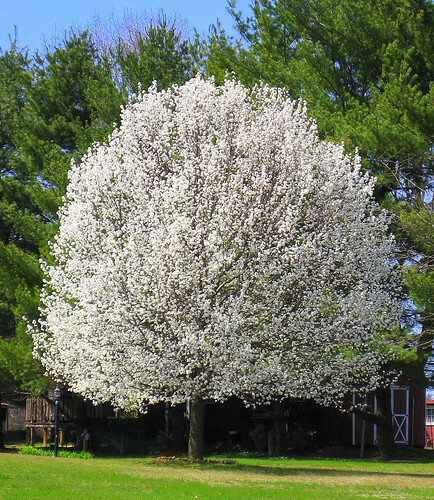 Fruit Trees are great for front yards because most of them put on a beautiful show of flowers in the spring and then fall color. Most are deciduous. Good choices include pear (photo above), apple, persimmon, pomegranate, fig (though should only be use if espaliered or you have a very large yard), and stone fruit. We can’t forget some vines. Grapes make a great addition, especially if you have an entry feature such as an arbor or a covered walkway. As you can see they offer not only fruit but fantastic fall color. Herbs (culinary and medicinal) are probably one of the best front yard plants. You get quite the bang for your buck and they are very decorative. Most are evergreen and will flower. Rosemary, thyme, chives, feverfew, basil and chamomile are just to name a few. 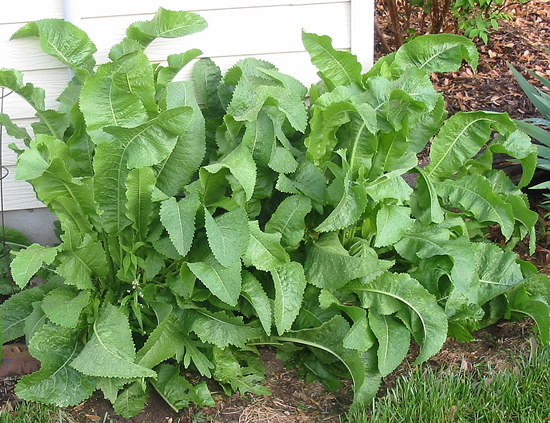 Horseradish is another great plant to add a new texture. Just be careful as it needs to be contained or it can become invasive. Evergreen huckleberries are a California native, being more drought tolerant than it’s cousin the blueberry. They prefer shade but can do sun in cooler climates. 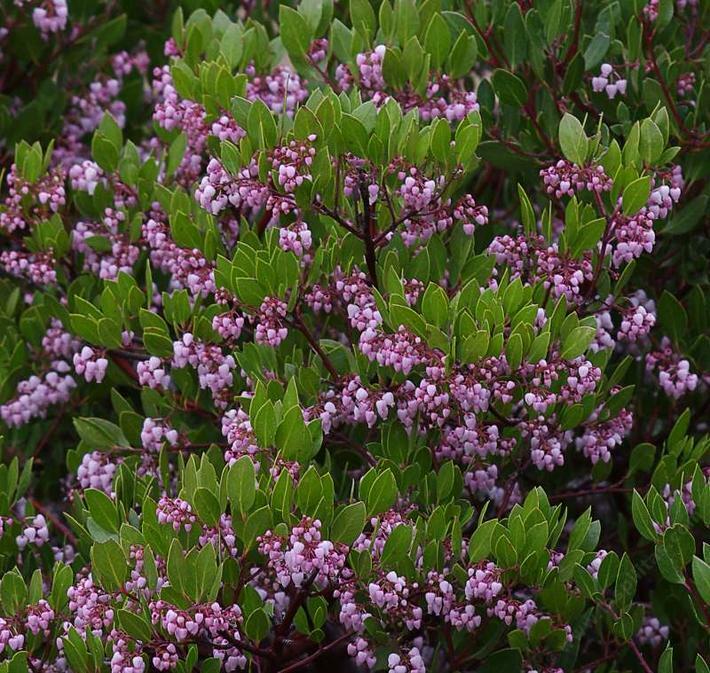 Arctostaphylos or Manzanita is a native Californian evergreen shrub or groundcover that has very attractive bark. In the spring it can be loaded with clusters of flowers that are followed by red edible berries. Kiwi vines are another gorgeous vine that you can use over arbors or covered walkways. 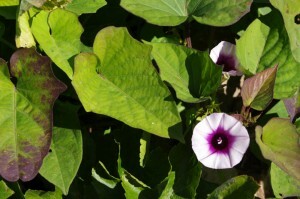 You will need at least two – one male and one female vine. Lemongrass is a great plant to add to your front yard because it simply looks like an ornamental grass. It adds texture and movement to your landscape. Olive trees are beautiful evergreen trees that give a Mediterranean feel. Passionfruit is another vine you should consider if you live in a warmer climate. Beautiful, showy flowers are followed by fruits that ripen to dark purple. Nasturtiums are a fantastic, rambling, vining groundcover that come in a multitude of flower colors. The leaves are edible and are commonly used in salads. Raspberries make a great deciduous screening plant. They do run so it’s a good idea to contain them. Rhubarb has these beautiful tropical looking leaves (but don’t eat them, only eat the stalks). There are different varieties that have different colored stalks. 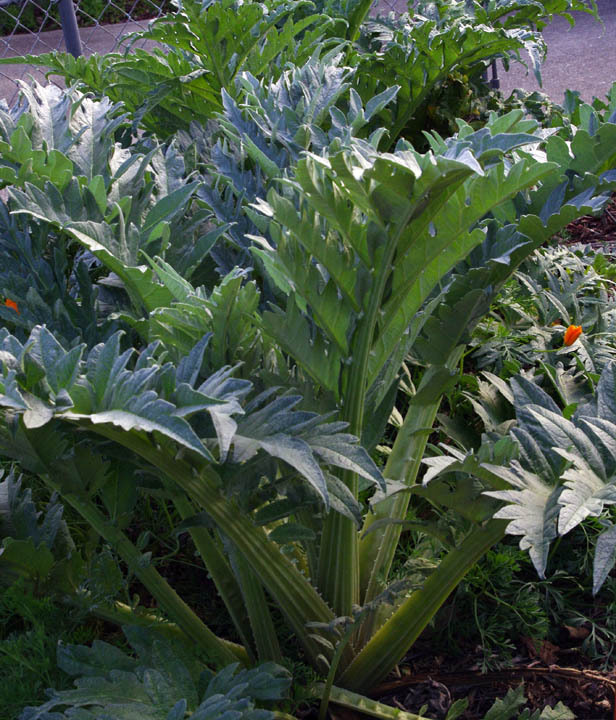 The leaves get huge and along with red stalks they add a lot of interest to the garden. Rugosa Roses are where we get rose hips. They come in a variety of colors and of course have showy flowers. They can spread a bit by runners. Rose hips are commonly used in herbal teas but you can also use them to make jellies and candies. Runner Beans are a great cool season vegetable to grow. Around here they are actually perennial, showing up every spring. Beautiful showy flowers cover them until the tops die back from frost. 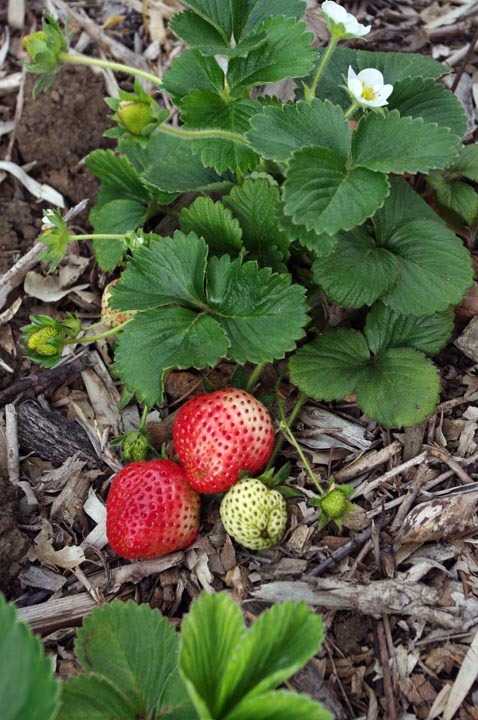 Strawberries make a fantastic spreading groundcover. The cute white flowers quickly turn into the showy red fruit. And if you’ve never had a fresh picked strawberry that has been warmed by the sun, you’re truly missing out. Sweet potatoes have gorgeous sprawling vines and make a wonderful groundcover. They also look great cascading over walls. They have showy flowers. Just remember to dig them up before the frosts come. wifey and i finally decided to go for it and plant along the house, on the side and in the front yard. we’re in southern california. i just noticed today how the side of our house faces south and is bathed in sunlight at 8 am. gonna be a fun weekend, and i’ll be using many of these you suggest, including the huckleberry. thanks! Great article- I have edible landscaping in our front yard and no one even realizes it! It is mainly perennials and self-seeding annuals. I also grow medicinal plants and flowers for cutting (and eating). There are some amazing herbs that are very ornamental – I am growing red veined sorrel which I would plant whether or not I knew I could eat it. Another beautiful climber for warmer climates is Malabar Spinach. Great post. Thanks for adding a few more ideas to my list and educating us all! Love the article. I would love suggestions for a zone 5 edible front yard that uses mostl;y perrinials. I asked your question on our Facebook page. Go check it out for advice from others that live in Zone 5! Day Lillys are another great edible addition as well as onion, chives and garlic all of which have a pretty flower and can replace the society agapanthus. y tomato plants look so pathetic I am considering rooting new plants from the healthier “parts” for fall , in hopes of preserving more for winter usage. Also considering planting thornless blackberry seeds to see how long it takes to GROW more plants from them instead of just tossing seedy waste into compost pile. Any helpful comments would be WELCOME.